Cookie With Daffodils, Feline Photo prints are made in archival inks on Epson Silky Photo Paper, Cold Press Digital Giclee Paper or Artist Canvas and available framed and unframed. From several years ago, one of those mornings, I think Cookie is watching Namir. I like the odd angle, the blur and the crop. It’s as if I’m standing right there with Cookie, looking over her ear as I often did. 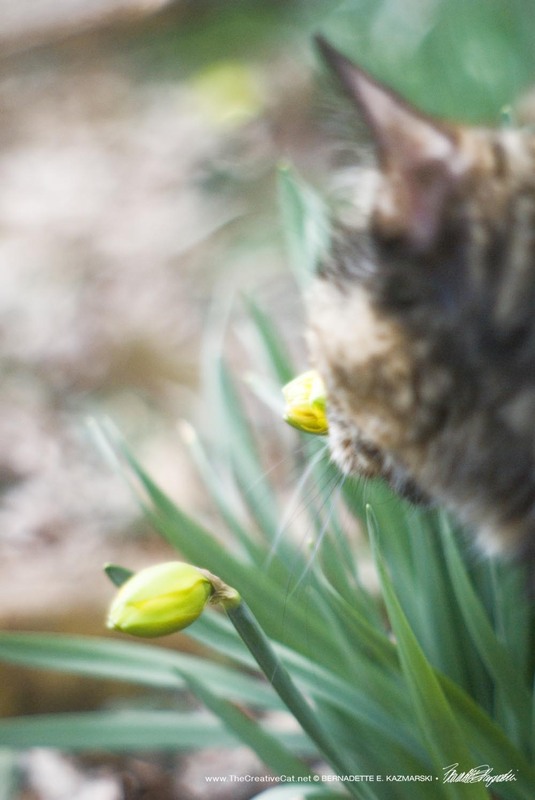 Because Cookie was outdoors with me for so many years and loved the spring garden especially I have many photos of her in the daffodils. We went outdoors every morning, and as the sun began rising earlier I started working outdoors for a little bit each day though I still did most of the garden readiness on the weekends until May. This entry was posted on March 26, 2018 by Bernadette.